↑ Web. Democrats Randolph, Dill, Mallek win seats on Albemarle Board of Supervisors, Staff reports, Daily Progress, World Media Enterprises, November 3, 2015, retrieved November 3, 2015. ↑ Web. Grocery store owner enters Rivanna District supervisor race, Sean Tubbs, Charlottesville Tomorrow, April 21, 2015, retrieved December 13, 2016. ↑ Web. 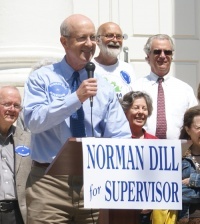 Dill not running again; Gallaway named Albemarle supervisors chairman, Allison Wrabel, Daily Progress, World Media Enterprises, January 10, 2019, retrieved January 10, 2019. ↑ Web. November 2015 General Election Official Results, State Board of Elections, November 5, 2015, retrieved July 28, 2016. This page was last edited on 14 January 2019, at 17:52.